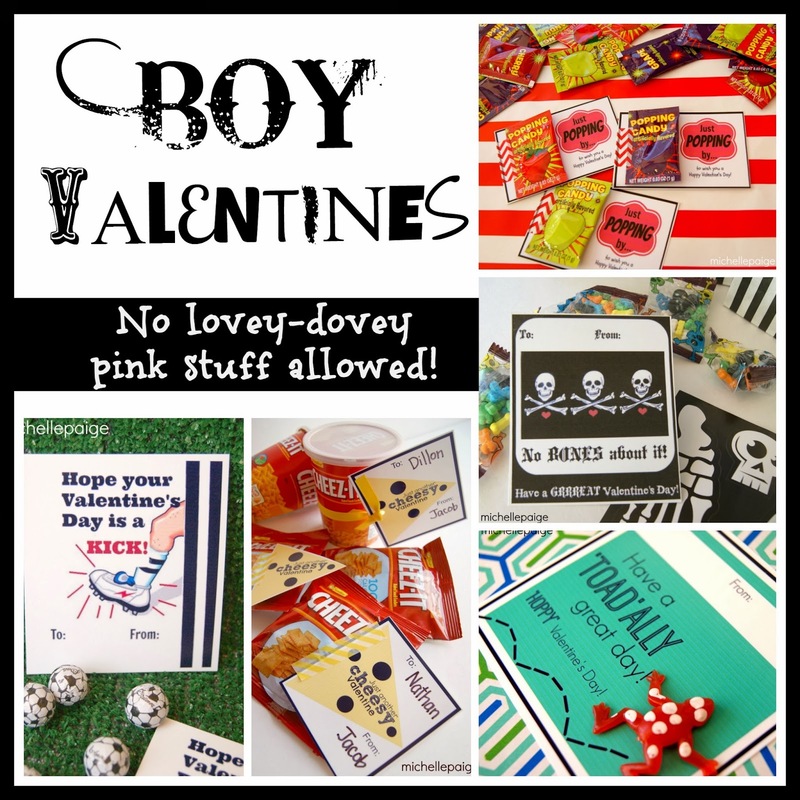 Today I'm sharing some Valentine ideas for the boys! 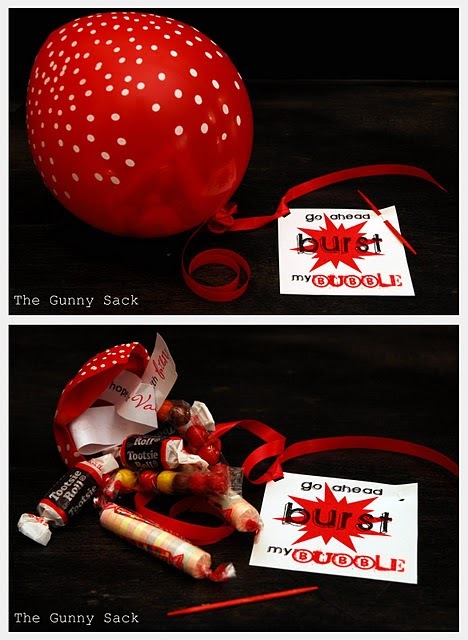 but sometimes the boy valentine ideas are just a bit more difficult to come up with. It helps to separate them out a bit from the pack. This is a valentine I posted last year, click here for the full post. My 9 year old son loved making these for his Cub Scout den. This version is from Gallamore West. 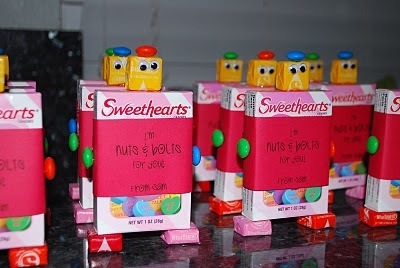 "I'm nuts and bolts for you!" including this super cute one from the Crafting Chicks. 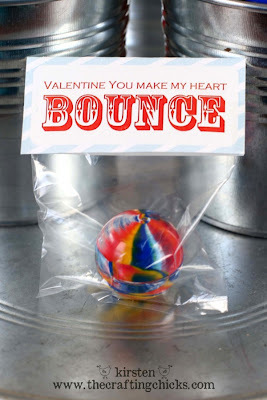 "Valentine, you make my heart BOUNCE." "Just 'bouncing' by to wish you a Happy Valentine's Day!" "I always have a 'ball' when I'm with you." Did you see this one with the army guys? Another creative idea from Alexis at Jac O' lyn Murphy. The surprise is inside the blown up balloon! The tag comes with a poking stick (a toothpick) to pop the balloon. Idea created by Tonia at the Gunny Sack. the brilliant mustache lollipops from Jennifer at Big D and Me. For more mustache valentine ideas--click here! 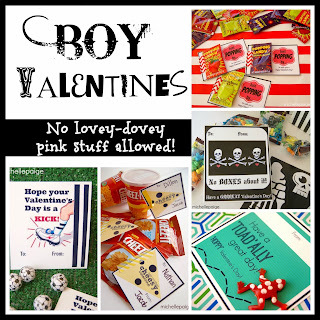 Check out these posts for even more boy valentine ideas! 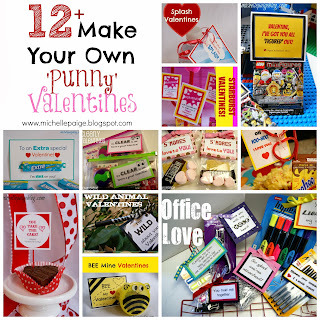 12 Kid Valentines You've Got to See! Click here for Valentine Link Party. Thanks for the shout out! I appreciate it!! :) Have a great week! I love all the great ideas for boys! Thanks for including my robots... yours came out so cute too! Great ideas for boys! I think I'll have to make a couple for my nephews! Oh my goodness - what a nice surprise to see the mustaches! Thanks so much Michelle! I needed this! I have 4 boys it's hard to find cute valentine ideas for them. 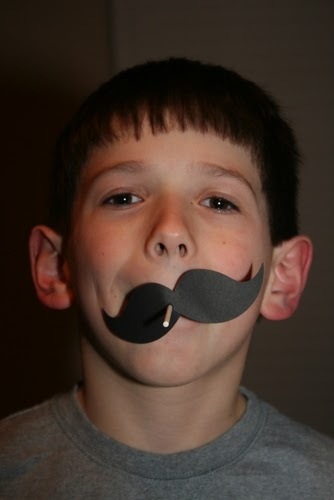 I have a feeling the mustache pops will be a hit. Thanks for the feature! I love these other ideas...so fun!! These are great ideas! 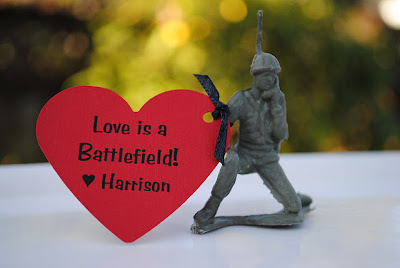 I hope you'll add this to my I Heart Projects Party! Oh such great ideas! There are never cute ones in the store for boys! This year we are definitely making some of these! !